1678년에 전국에 분포하는 목장을 그린 필사본 채색지도첩이다. 1권 42면으로 구성된 이 지도첩은 모두 3장으로 구성되었다. 첫 장에는 진헌마정색도(進獻馬正色圖), 두 번째 장에는 도군별 목장상황을 담은 회화식 지도, 세 번째 장에는 이 지도첩의 제작 동기와 시기를 알려주는 허목(許穆)의 기문(記文)이 실려 있다. 허목은 당시 사복시의 제조였는데, 그 이전에 작성되었던 목장지도를 수정편찬하여 목장지도를 제작하게 하였다. 회화식 지도부분에는 전국의 목장 소재지를 지도에 그려넣고 소와 말, 목자(牧子)의 통계와 목장의 면적, 폐장된 목장의 상황 등을 기재하였다. 효종이 북벌계획(北伐計畵)을 추진함에 따라 군마(軍馬) 양육지로 전국의 초원지대와 도서 ·황무지 등에 목장을 확충하였는데, 이 지도첩은 그 위치와 크기, 상황을 시각적으로 기록한 것이다. 각 폭(幅), 각 면(面)마다 군명(郡名)과 이정표(里程表)를 기입한 이 국립중앙도서관 소장의 이 지도첩은 당시의 마정(馬政)과 목장에 관한 시책을 알 수 있는 귀중한 자료이다. This 42-page album of hand-drawn colored maps of horse ranches was produced in 1678. It consists of three chapters: the first chapter comprised of a painting of horses in diverse colors to be presented to the king; the second chapter of painting-like maps of horse ranches in different provinces and counties, representing their respective situations; and the third chapter of a document written by Heo Mok (1595-1682) about why the map album was produced and when. 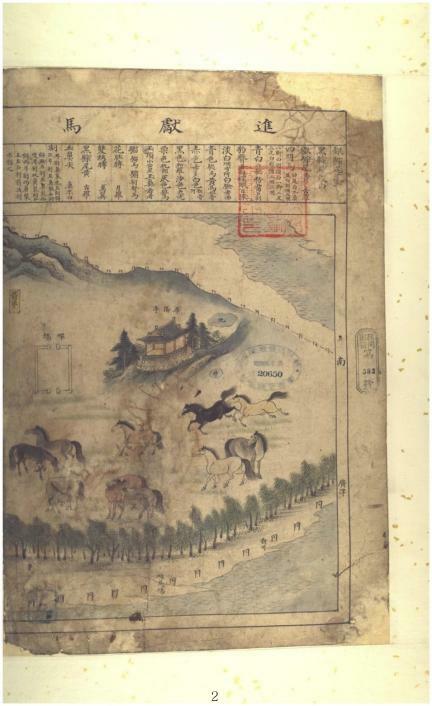 As senior supervisor of the Royal Stable Court, Heo Mok had these maps produced by revising earlier ranch maps. The painting-style maps are marked with ranch sites in pictorial images, along with concerned information such as the numbers of horses, cattle and shepherds, ranch areas, and situations surrounding closed ranches. Horse ranches were expanded in accordance with the northern expedition plan of King Hyojong (r. 1649-1659). Grasslands, wastelands and islands around the country were turned into pasture. Maps in this album are pictorial presentations of their locations, areas and other circumstances. 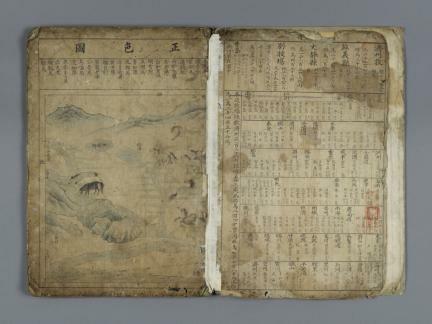 Each map carrying a county name and mileposts, the map album is a valuable material for study of state horse management and ranch policies during the Joseon Dynasty. It is housed at the National Library of Korea.